for contributing to the (either/or) editing, illustrating, translating, interpreting, continued improvement and further completion of this "Highlighted Illustrations" webpage as well as other of this sites' webpages. 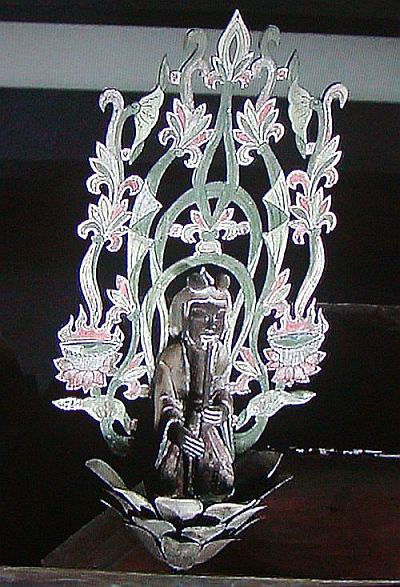 seated in yogic position on a throne. 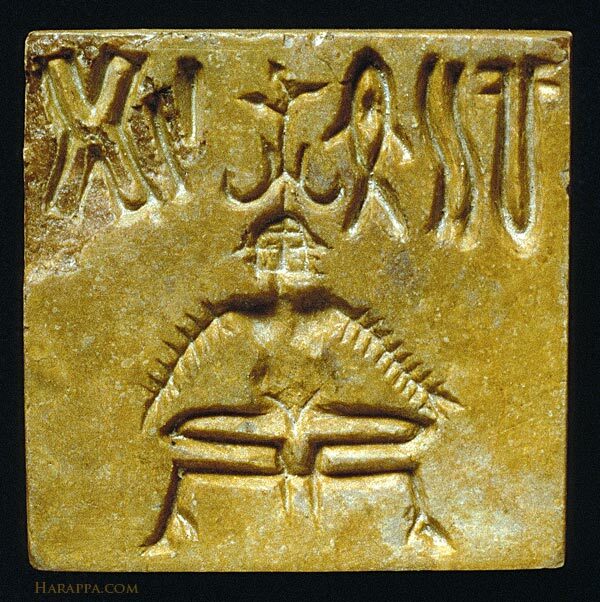 Harappan Bronze Age Culture, c. 2600-1900 BCE. Dimensions: 2.65 x 2.7 cm, 0.83 to 0.86 cm thickness. Excavated at Mohenjo-daro, present-day Punjab, Pakistan. Now in the Islamabad Museum. at Tun-huang on the Silk Road, in W. China. resembles the modern Chinese 6-holed 't'ung-hsiao', 洞簫, Jap. : 'dōshō'. 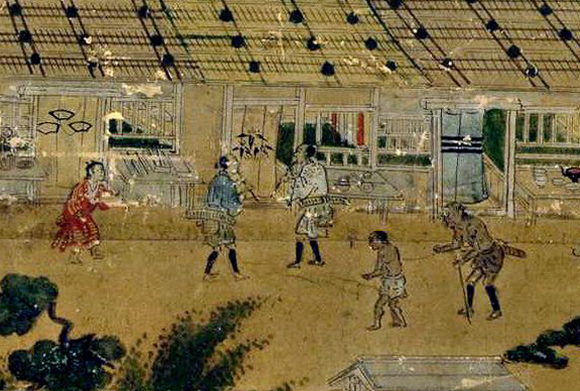 Female Chinese musicians performing in the T'ang Emperor's palace, mid-8th century. 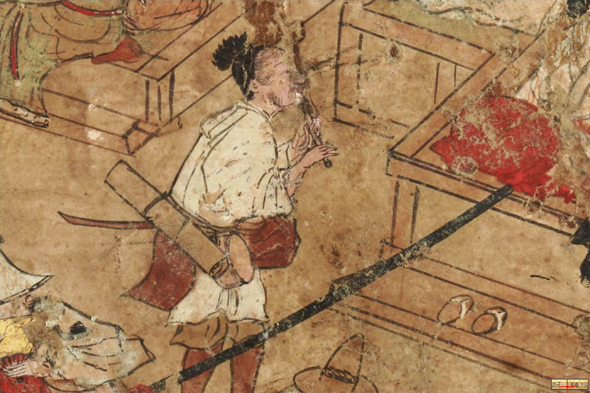 In the backgrouns to the right we see a musician blowing a medium long vertical flute - maybe a 't'ung-hsiao', 洞簫, Jap. 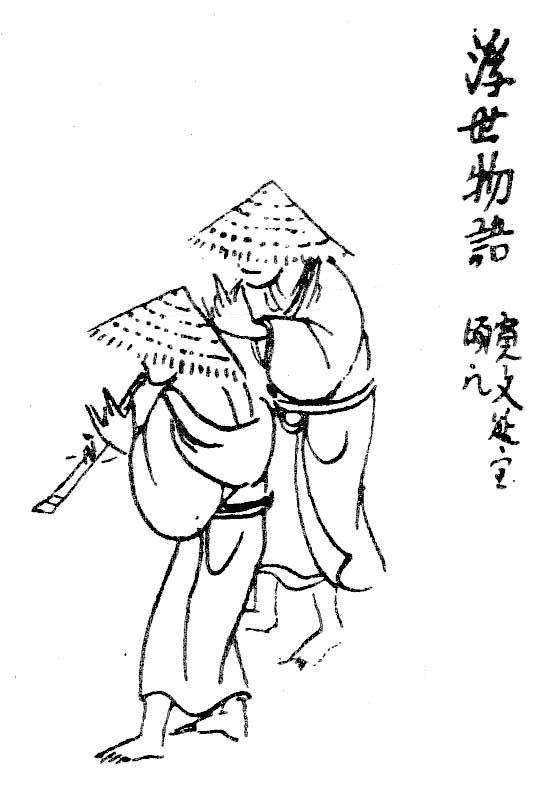 : 'dōshō'. 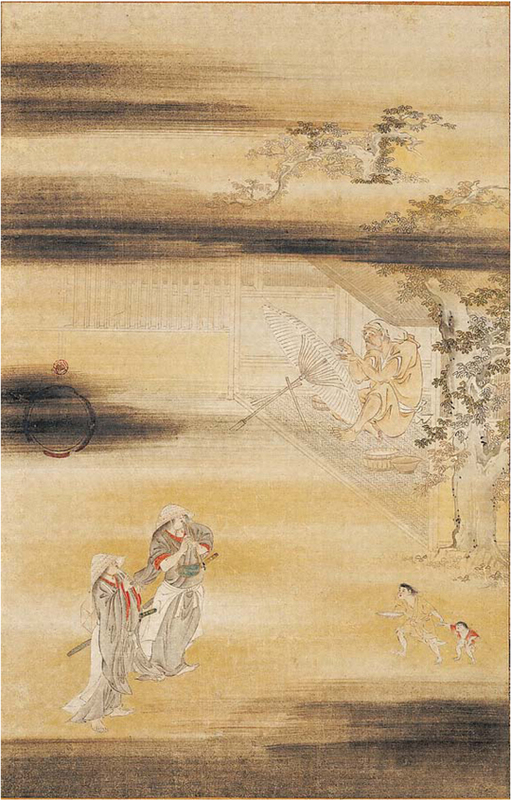 Scroll painting on silk attributed to the Chinese Imperial court painter Chou Wen-chü, ca. 970. 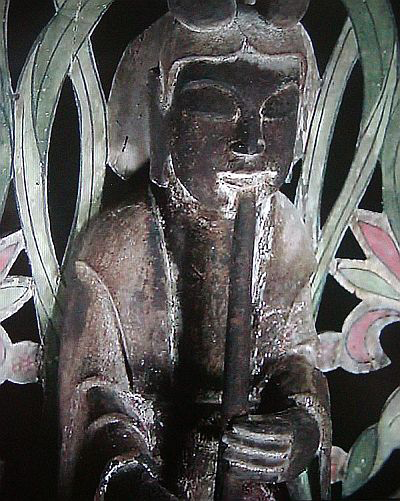 Small sculpture of a bodhisattva playing a shakuhachi look-alike. Discovered in 2009 during a restoration of the canopy overhanging the Shaka Triad being housed in the Hōryū-ji Kondō. 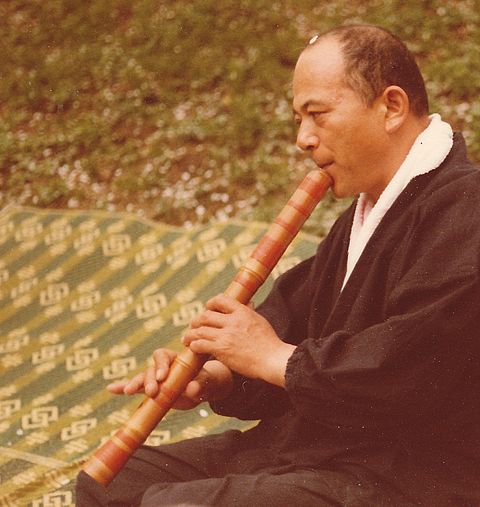 Bodhisattva musician playing the shakuhachi, Tōdai-ji, Nara. 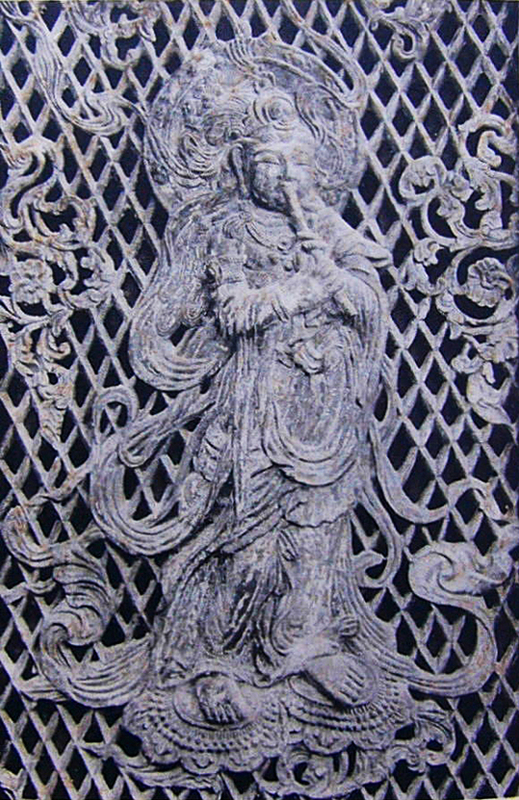 Detail of a large bronze lamp standing in front of the Great Buddha Hall. One of the very few remains of the original 8th century temple. Date of original: 1494. 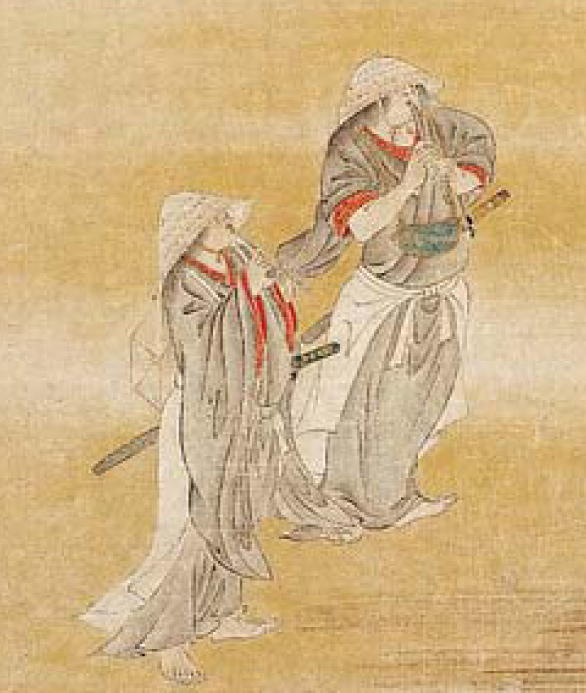 Kōsetsu-bon edition, detail. Dated to between 1521 and 1532. 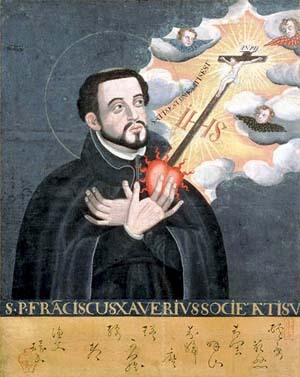 The Spanish Jesuit missionary Francis Xavier lands in Kagoshima and begins movement to spread Christian teaching in Japan. 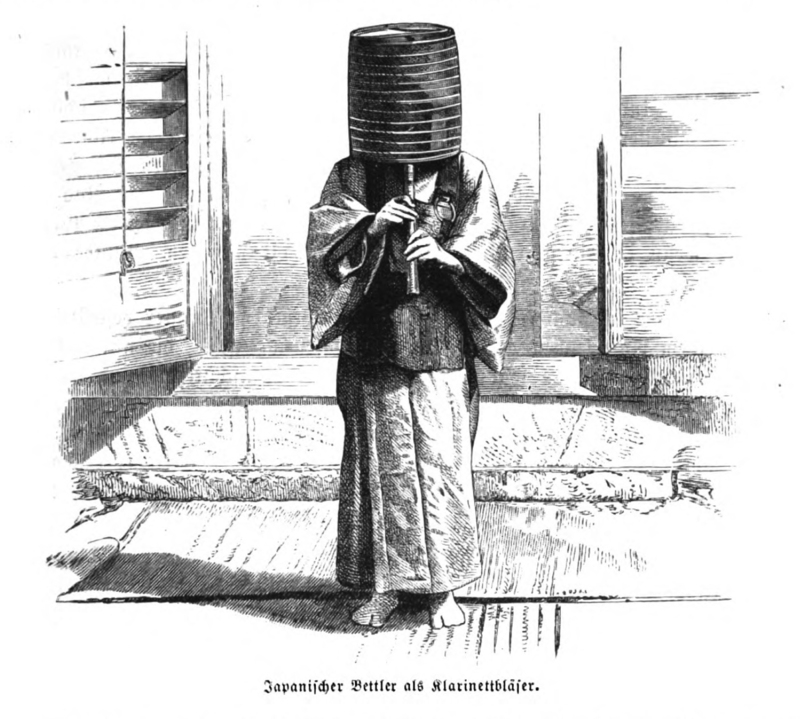 When, approximately, did the komosō of Medieval Japan adopt Fuke Zenji as their idol of shakuhachi asceticism? "Screen with Genre Scenes of the Twelve Months"
that he is carrying on his back? Uesugi-bon edition. Commissioned by Oda Nobunaga. The 26 Christian Martyrs in Nagasaki. 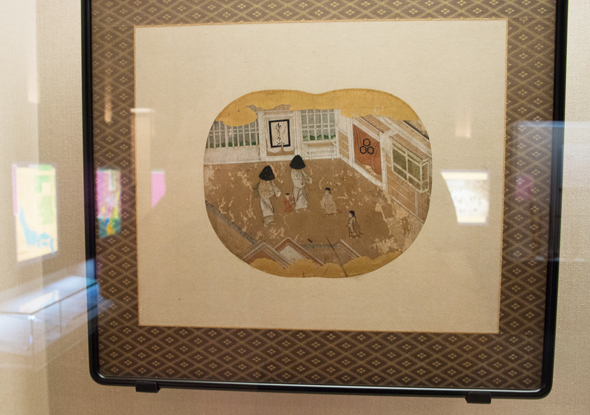 Painting by Eustaquio Maria de Nenclares, 1862.
on the order of Toyotomi Hideyoshi, then the absolute ruler of Japan. Late Momoyama Period? (1573-1615) - Early 17th century? 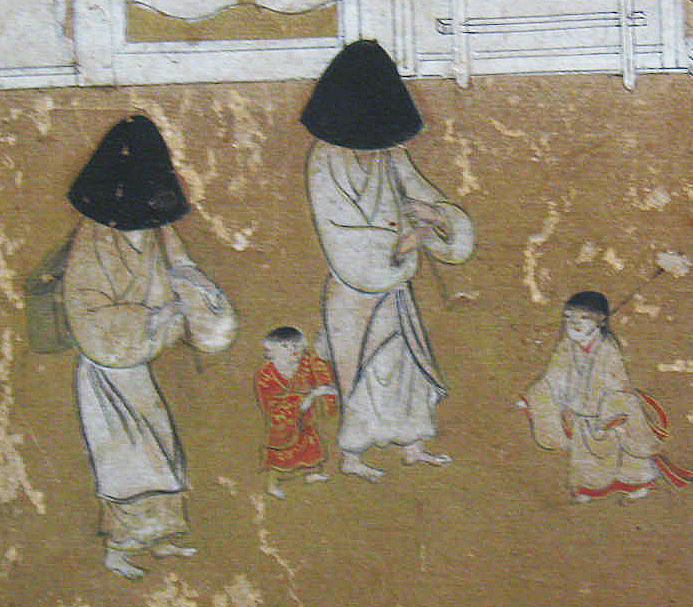 Yet unidentified, so far undated, quite early 17th century 'komosō' picture. with everyday scenes, dating from the early 1600's? "Pictures of People of Various Occupations in Their Workshops". 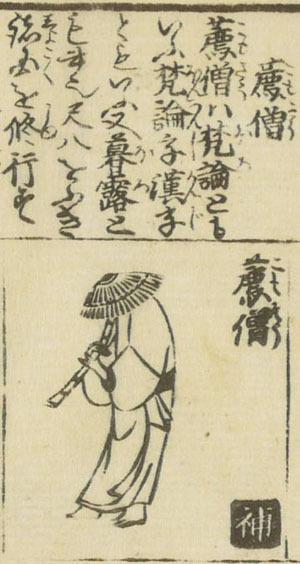 One would not term it "a copy", however, but rather an anachronism, as the shown mat-carrying 'komosō' type of mendicant flute-player had been replaced by the 'komusō' many decades before 1735. 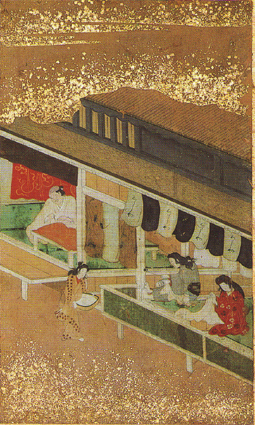 "Pictures of People of Various Occupations in Their Workshops"
17th century, before 1630, according to Japanese art experts. 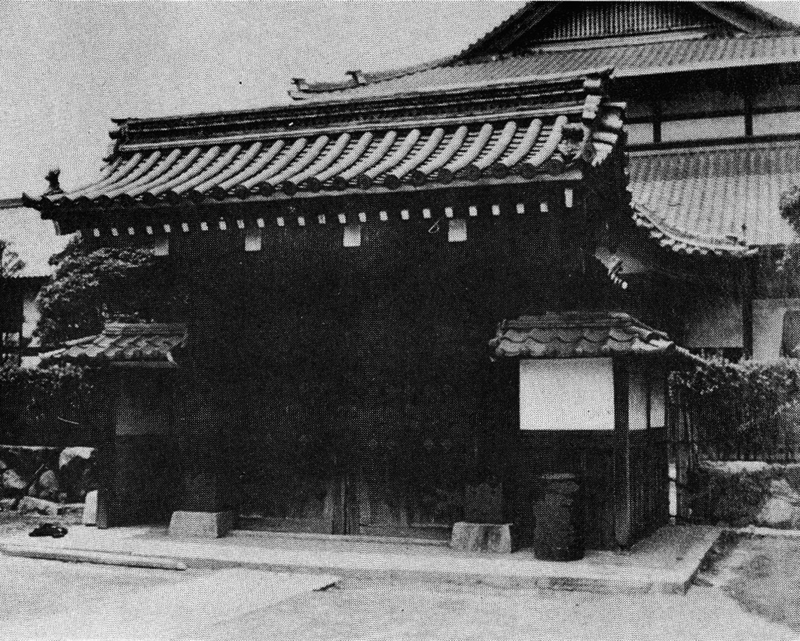 Owned by the Nezu Art Museum, Tōkyō. 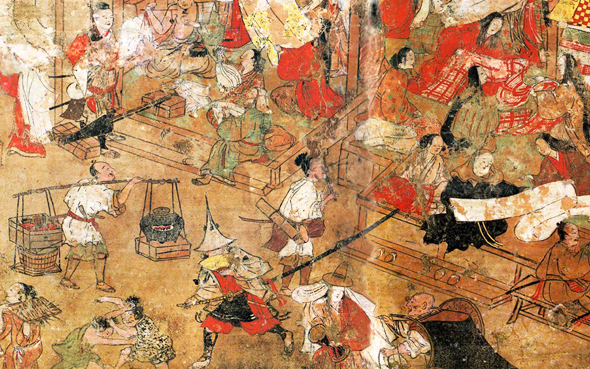 This is a modern Japanese painting depicting a very early 17th century 'komosō' "mat monk"
The practice of fumi-e, 踏み絵 - the forced trampling of Christian images - is introduced and kept in constant national execution and effect turough the year 1858. 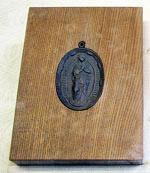 The religious authorities of the Tokugawa shōgunate requires suspected Christians to step on images of Jesus Christ or the Virgin Mary in order to prove that they are not members of that outlawed religion. 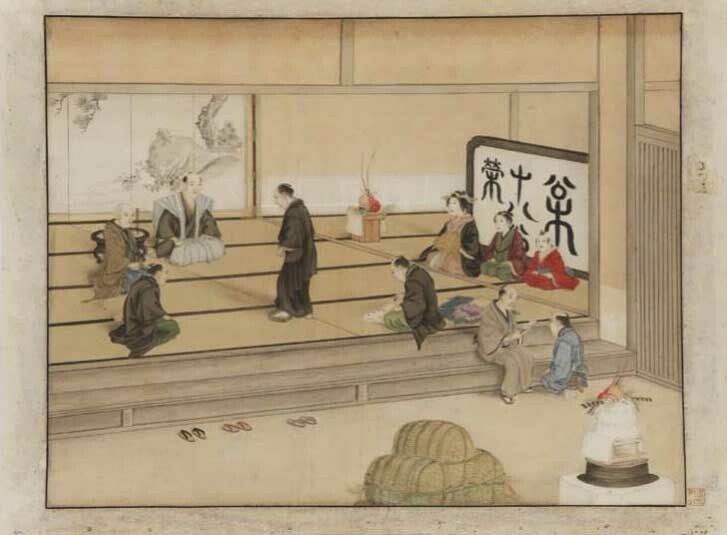 Painting of a 'fumi-e' inquisitional ceremony by Keiga Kawahara, created sometime during 1800-1829. 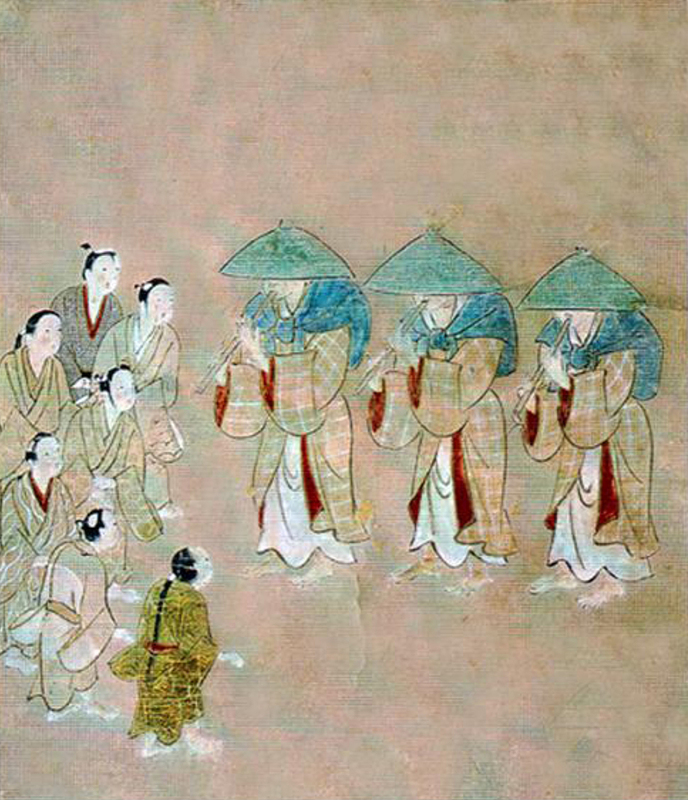 Attributed to Iwasa Matabei, 1578-1650. Possibly dating from the 1630s or 1640s. 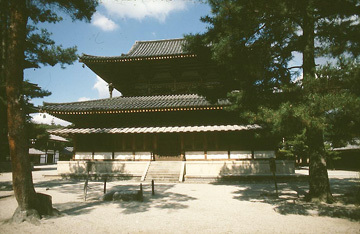 Owned by the Shingon Sect temple Tōya-san Fumon-ji Taishō-in near Matsudo City in NW. Chiba Pref. 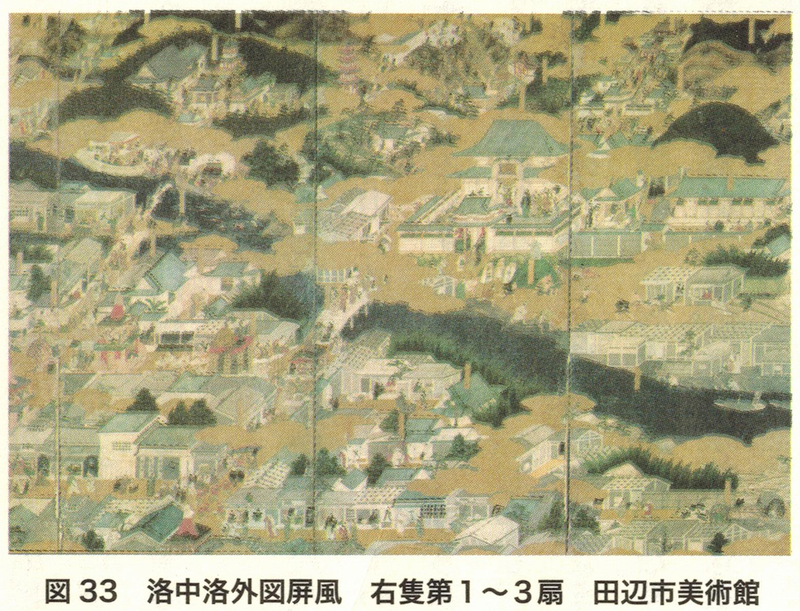 Source: Yamaguchi Masayoshi, 2005, p. 176. Acc. 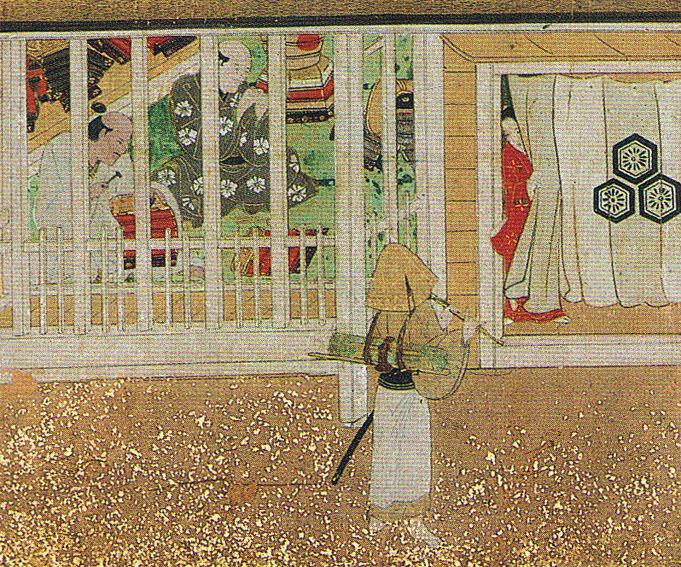 to Kakizaki Shōhō this picture dates from the Genroku Period, 1688-1704. If that were so, Iwasa Matabei cannot be the artist. 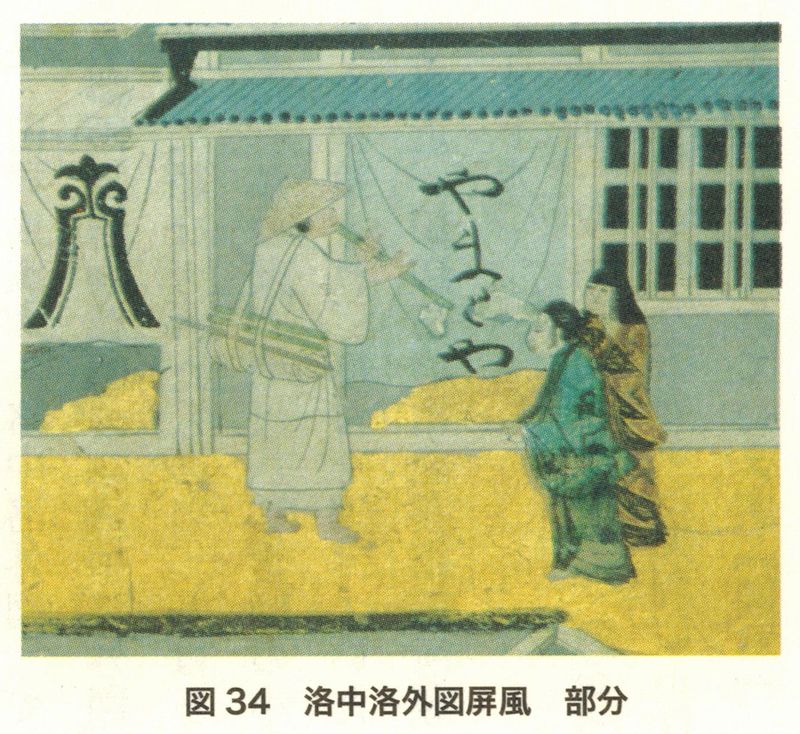 Link (possibly broken): "Genroku Period komusō figures"
Picture of a 'komosō' in a Kyōto street. of a 'Raku-chū raku-gai zu byōbu'. 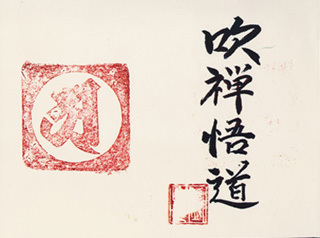 Source: Izumi Takeo, 2013, pp. 82-83. You find the detail in the very bottom of the screen, right above the Japanese character, 'zu', 図. The screen is a treasure of the Tanabe City Fine Arts Hall. Source: Izumi Takeo, 2015, p. 81. 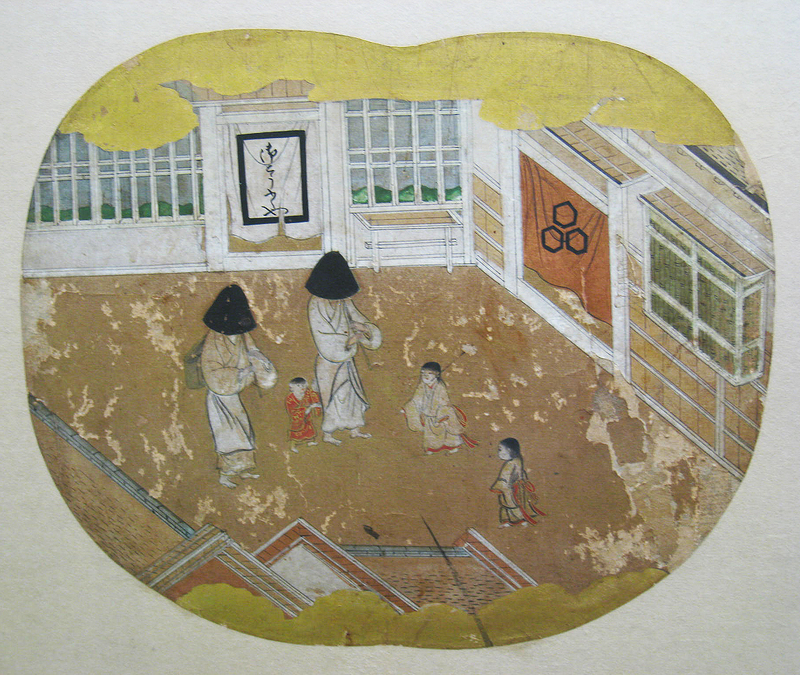 Yet not fully identified and dated early 17th century 'komosō' picture. Possibly dating from the 1630s or 1640s? Exhibited at Matsudo City Museum, Matsudo-shi, NW Chiba Pref. by Ronald Nelson, summer 2014. 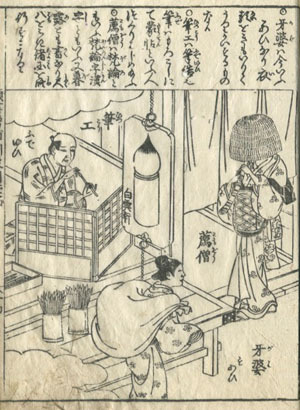 Jidai fūzokuga-fuku", 時代風俗画幅, "Scroll with Pictures of Customs of the Day". 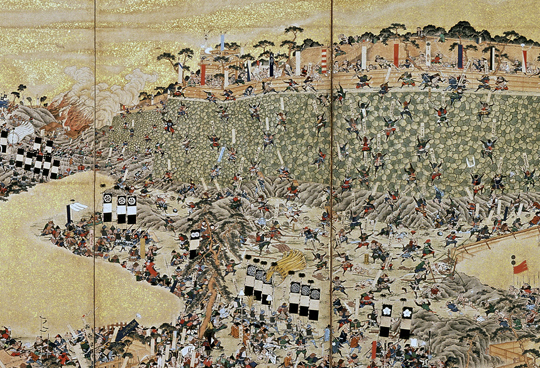 1637: Christian farmers, warriors, rōnin (masterless samurai) and others revolt against the authorities on the Shimabara Peninsula in Kyūshū. 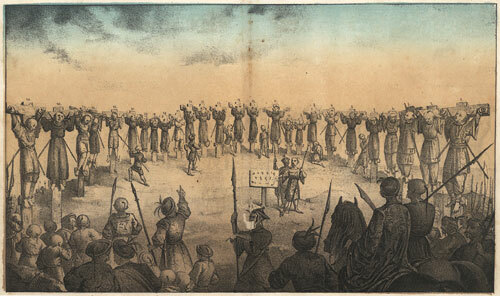 When the uprising was put down in 1638, tens of thousands had been killed. All surviving rebels, numbering in the thousands, were decapitated. 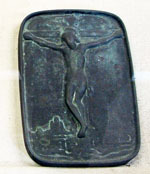 Christianity was now strictly outlawed in Japan and informers were encouraged. 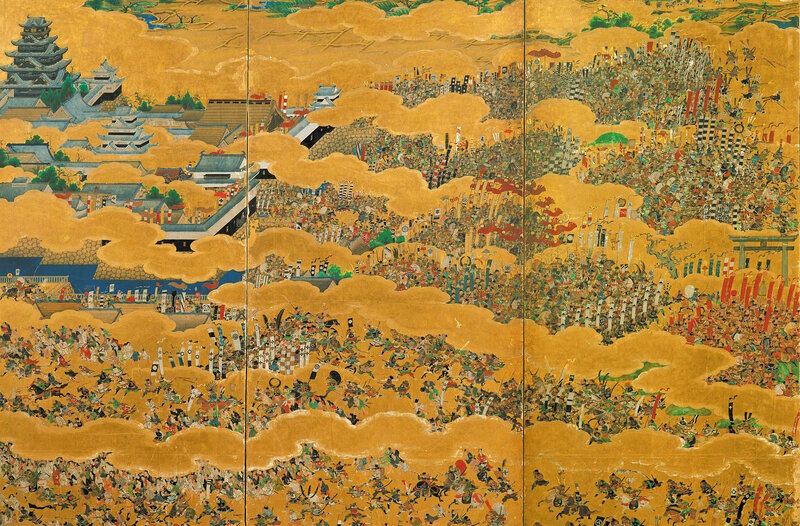 "Folding screen depicting the rebellion at Shimabara". 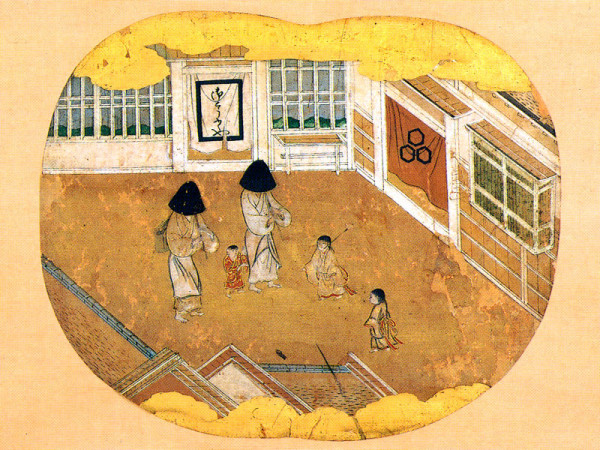 c. 1640-1645/1646: The term komu shizen, 虚無自然 is introduced. 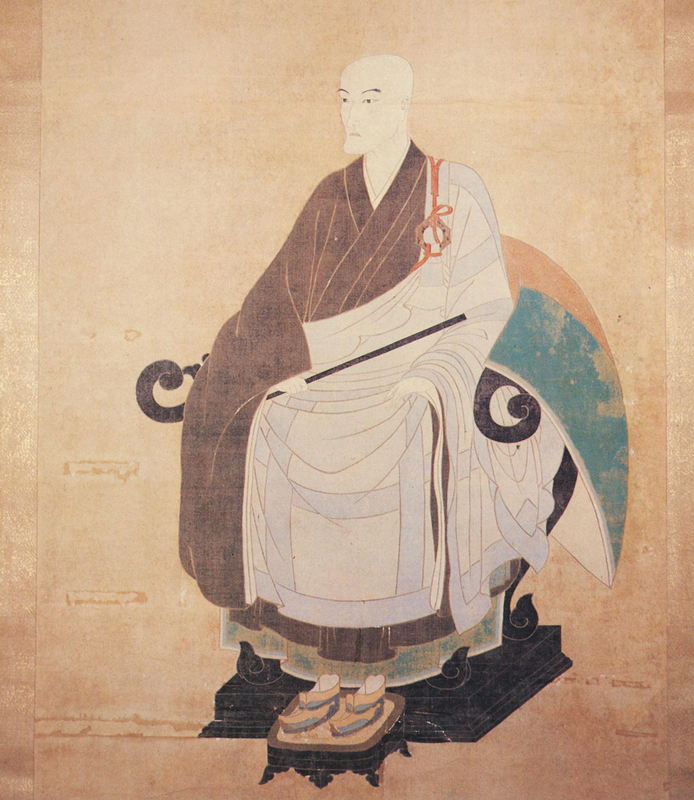 Isshi Bunshu, 一絲和尚, a most renowned Rinzai Zen abbot whose master was the great Rinzai Zen master Takuan Sōhō (1573-1645), lived from 1608 to 1645 (or 1646). 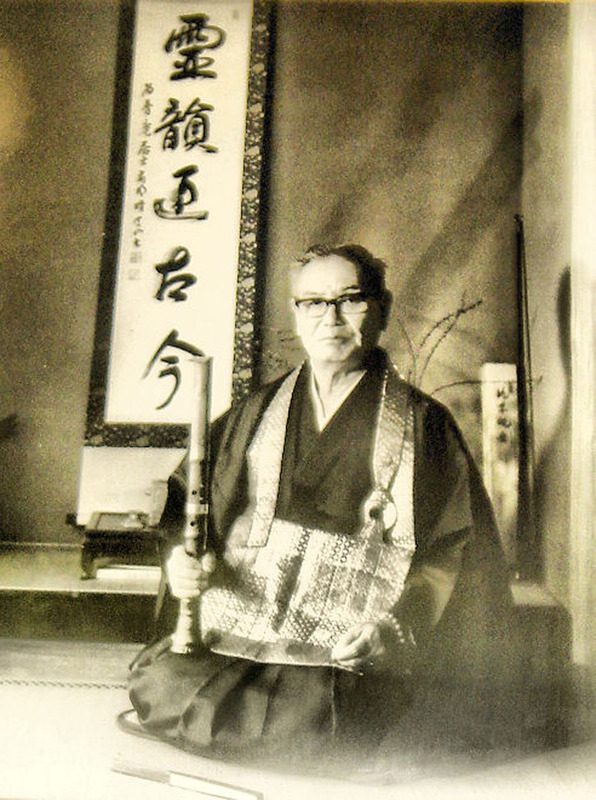 Portrait preserved at the temple Hōjō-ji in Kameoka City, Kyōto Prefecture. 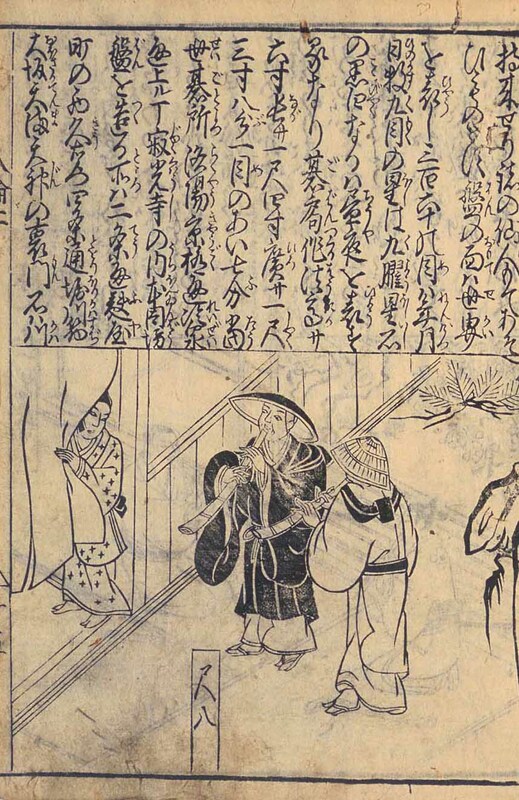 A letter from Abbot Isshi to a certain hermit named Sandō Mugetsu Anjū, 山堂無月庵主, presumably written shortly before Isshi's death in 1645/1646, presents the oldest known, surviving mention of the term 'komusō', 虚無僧, "Monk of the Non-Dual & None-ness". Here is a carefully retouched scanning of a xerox copy of the original hand-scroll, supplied to me in April, 1985, by the Kōkoku Temple in Yura, Wakayama. 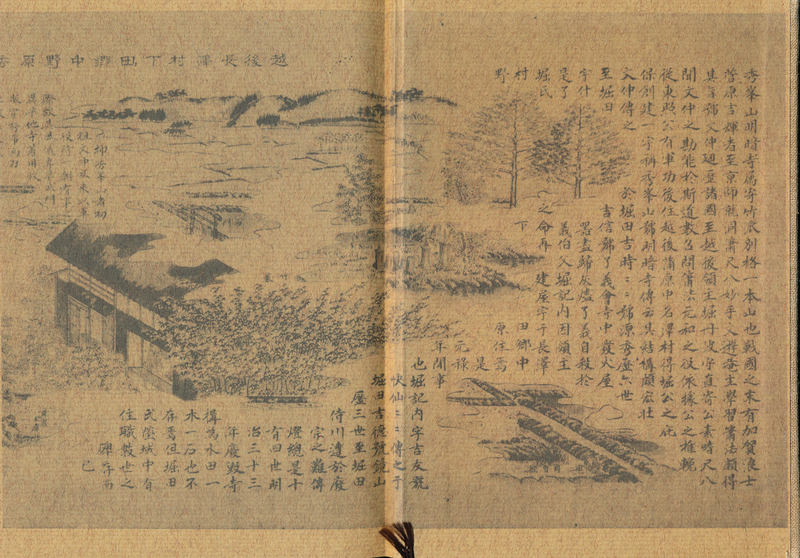 浮世物語 - "Tale(s) of the Floating World"
entitled 'Komusō zakki', "Komusō Notebook" - dated realistically in the mid-1870s. 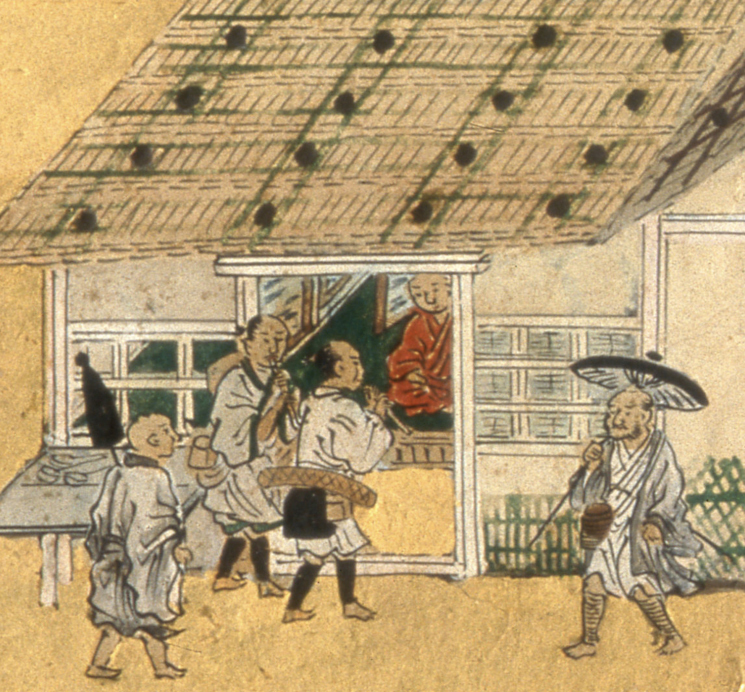 Detail from the 'Tohi zumaki', 都鄙図巻, "Town & Country Picture Scroll". 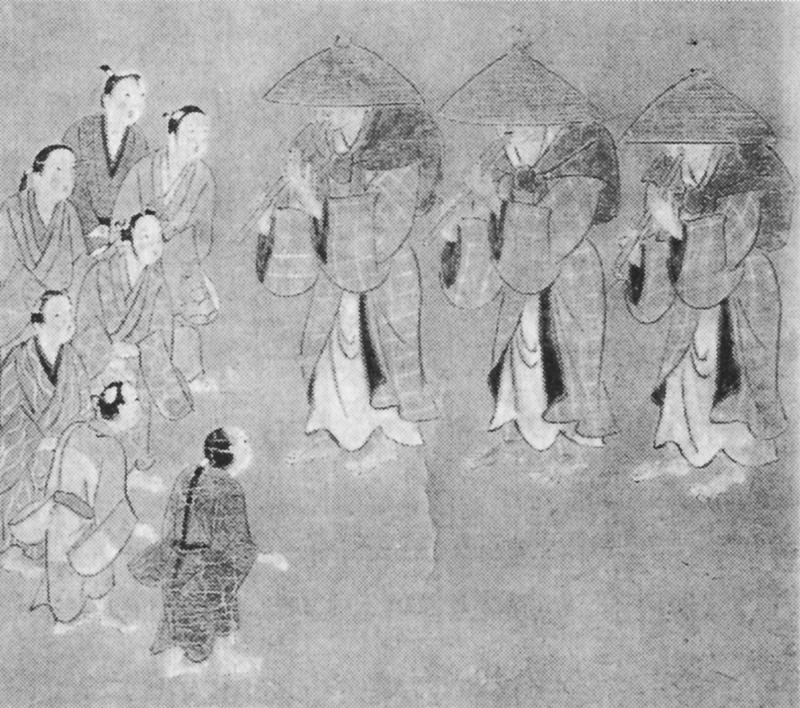 present day Tōkyō, where he died in 1705. In: Izumi Takeo, 2013, p. 93. A first edition, 'Kimmō zu-i', was published in 1666. 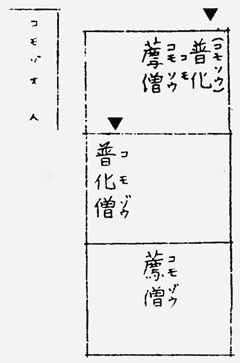 A third edition, 'Kashiragaki kinmō zu-i taisei', appeared in 1789.
with the archaic terms of 'bo(n)ron', 'bo(n)ronji', 'kanji', and 'boro'. - which is, certainly, not only limited to Zen Buddhist traditions, however. 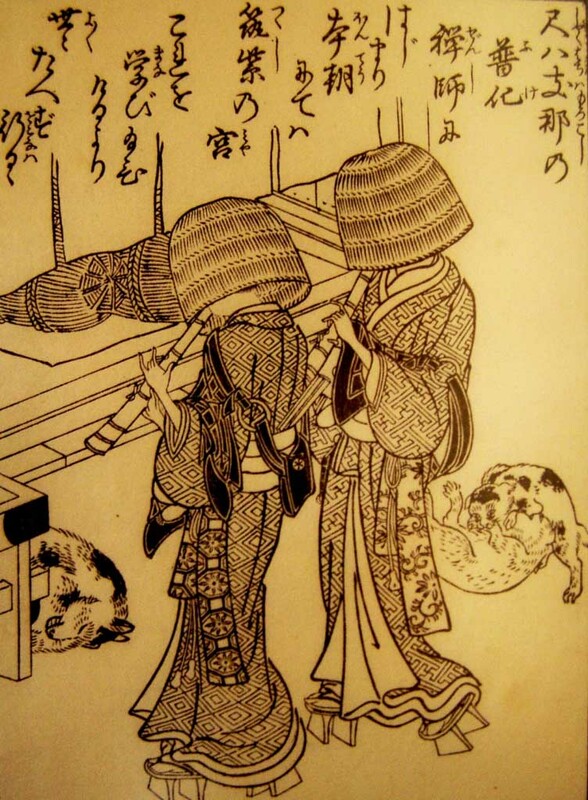 Book print of two 'komusō', 1768. 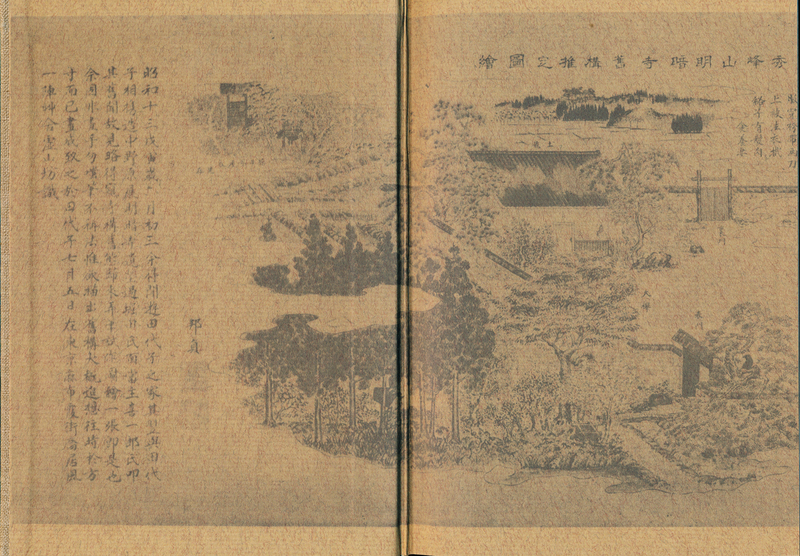 In: 'E-hon Azuma no hana', "Picture Book of Flowers of the East"
features the name of Fuke Zenji, 普化禅師, at the top, right. 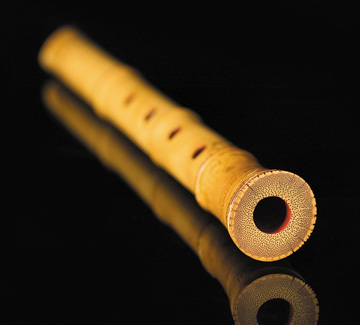 "Shakuhachi began with Zen monk Fuke [P'u-k'o] in T'ang China [Morokoshi]. 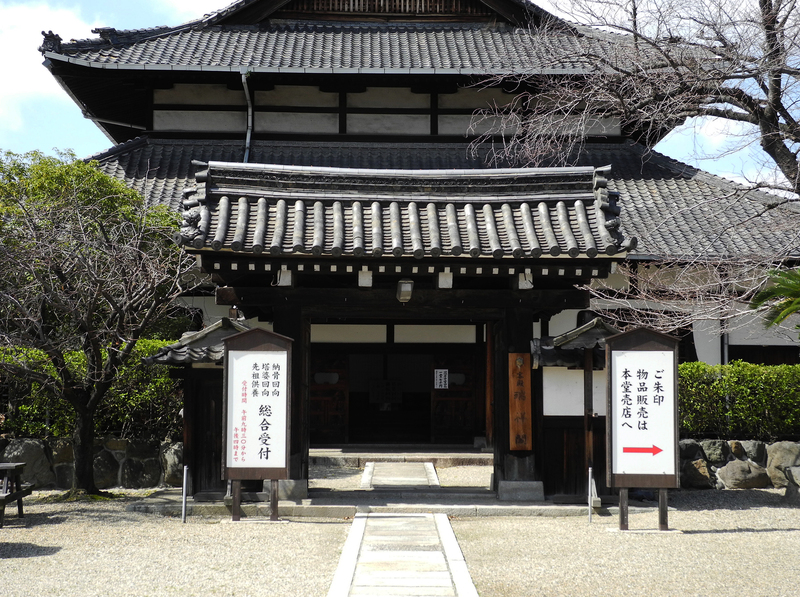 In our country [this dynasty] it was studied and taught in the Palace of the Nara Province [the Tsukushi Palace]." 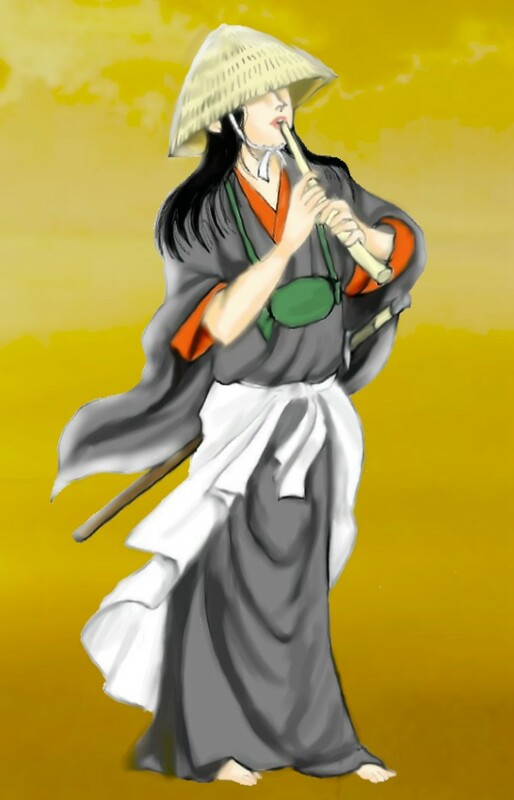 "Famous people [who played it] were Yasuda Shironaga [Jônaga? 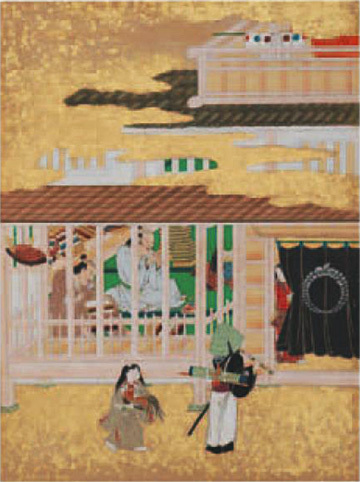 ], Ômori Sôkun and others. Nowadays it is being finely made strong with the use of 'kinko' [? lit. 'zither+tiger']." 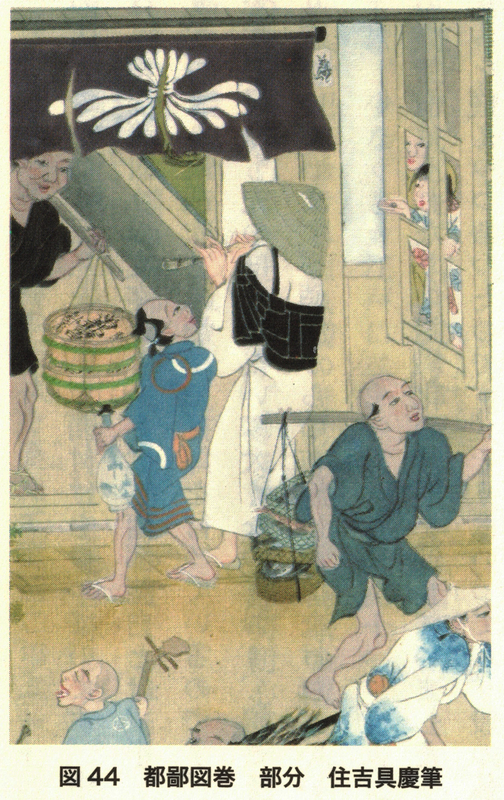 Complete edition'), Kansei 1, 1789, volume 4: "People". 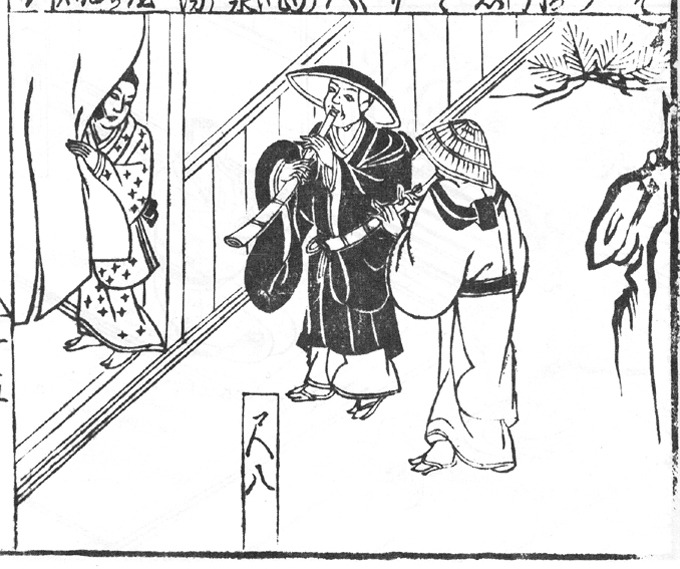 Author: Nakamura Tekisai (1629-1702). Illustrator: Shimokawabe Shūsui. 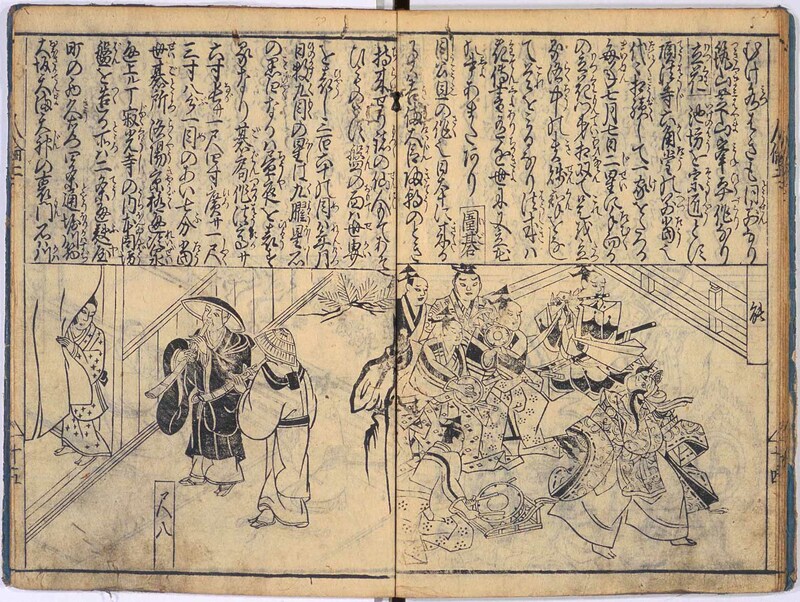 The first edition, 'Kinmō zu-i', was published in 1666. 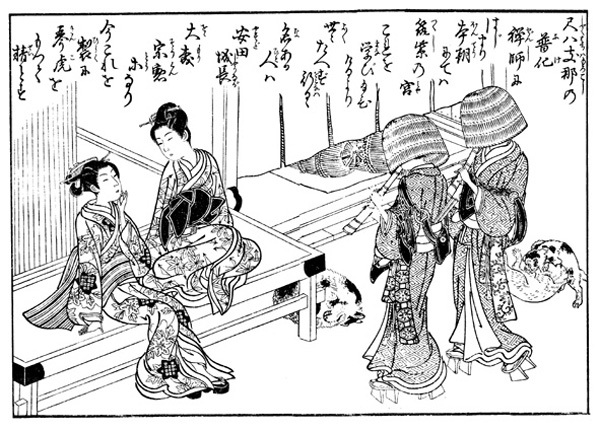 The second edition, 'Kashiragaki kinmō zu-i, appeared in 1695. 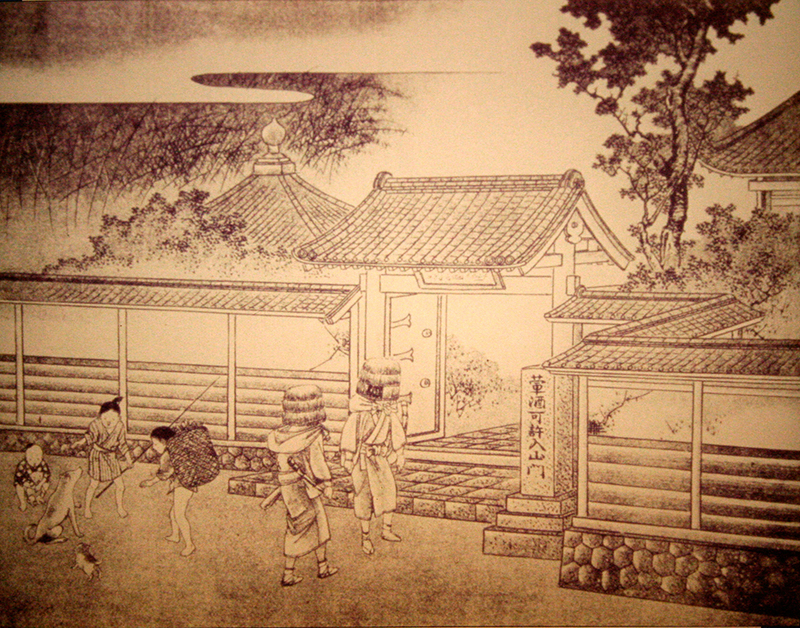 In: 'Yamato meisho zue', 大和名所図絵, "Pictures from Famous Places in Japan"
Photo reproduction by John Lee. "53 Stations of the Tōkaidō", 1806 edition. 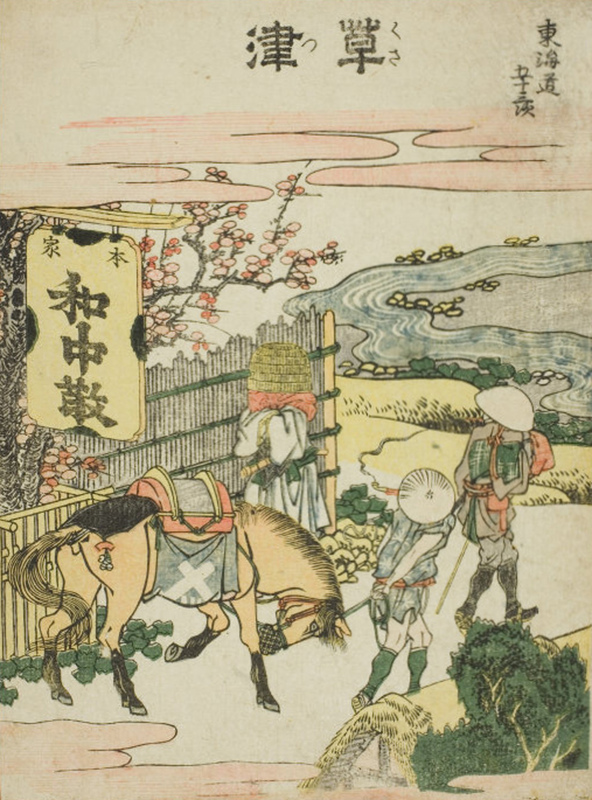 Ukiyo-e print by Katsushika Hokusai, 1760-1849. 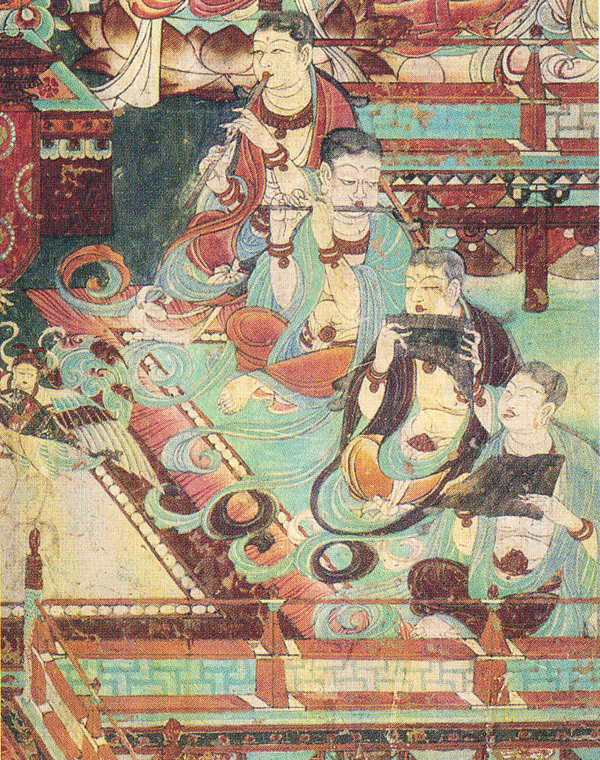 Right section of the scroll. Click in the picture to enlarge and open in a new window. 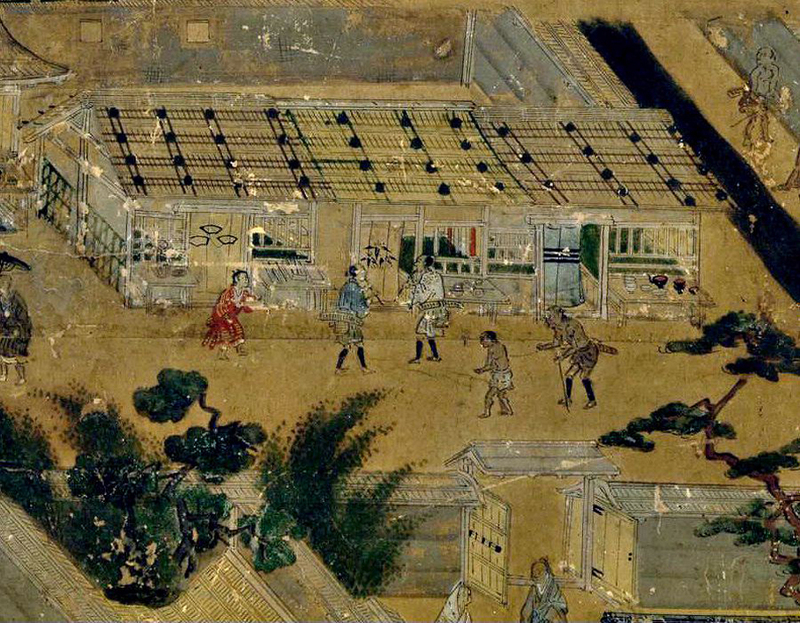 Horizontal scroll depicting the Edo Period Myōan Temple in the Echigo Province. No date given. Printed on the inside of the hardcover of Tomimori, 1979. Left section of the scroll. Click in the picture to enlarge and open in a new window. 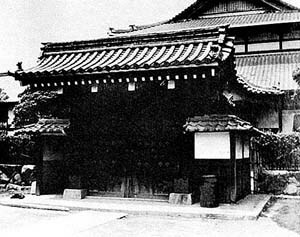 Gate of the Edo temple Ichigetu-ji in Machido, NW Chiba, during the 1800s. 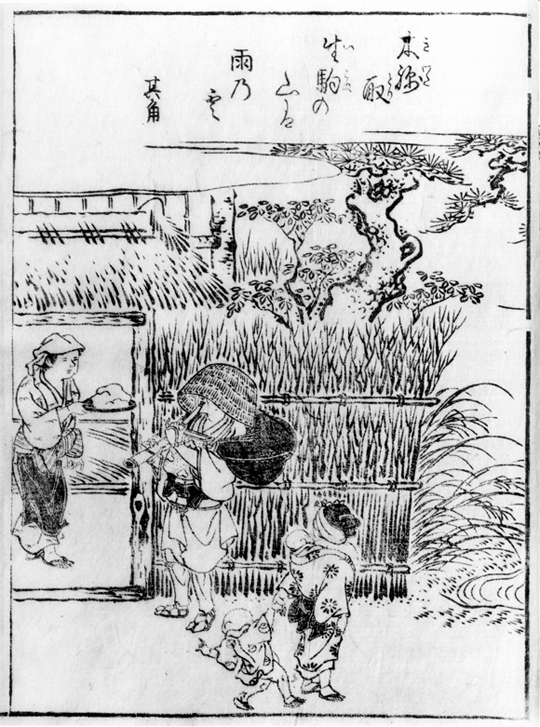 In the illustrated news publication 'Fūzoku gahō', 風俗画報, No. 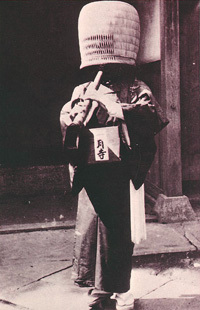 279, 1889.
all of its temples were closed and komusō mendicancy was prohibited. Myōan-ji's precious statue of its legendary founder Kyochiku Ryōen Zenji was, together with various especially important Myōan-ji documents, entrusted to the Zennei'in, a small subtemple of the grand Tōfuku Zen temple in SE Kyōto. 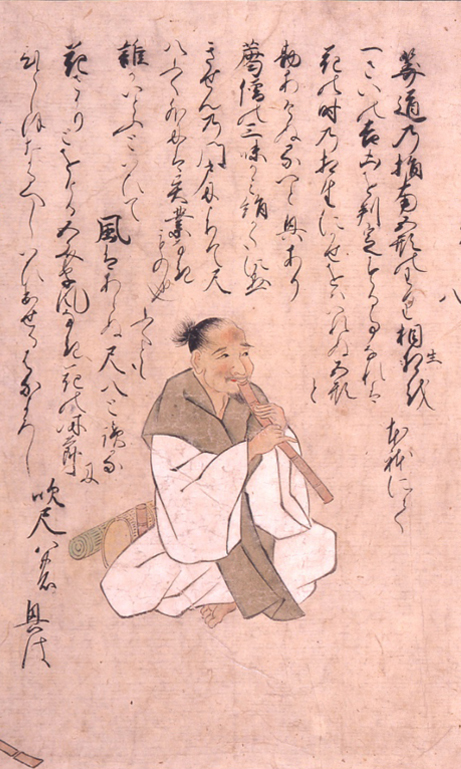 "A Japanese Beggar as Clarinet Player"
This is but the second oldest known Western picture of a performing shakuhachi-playing beggar lay monk. 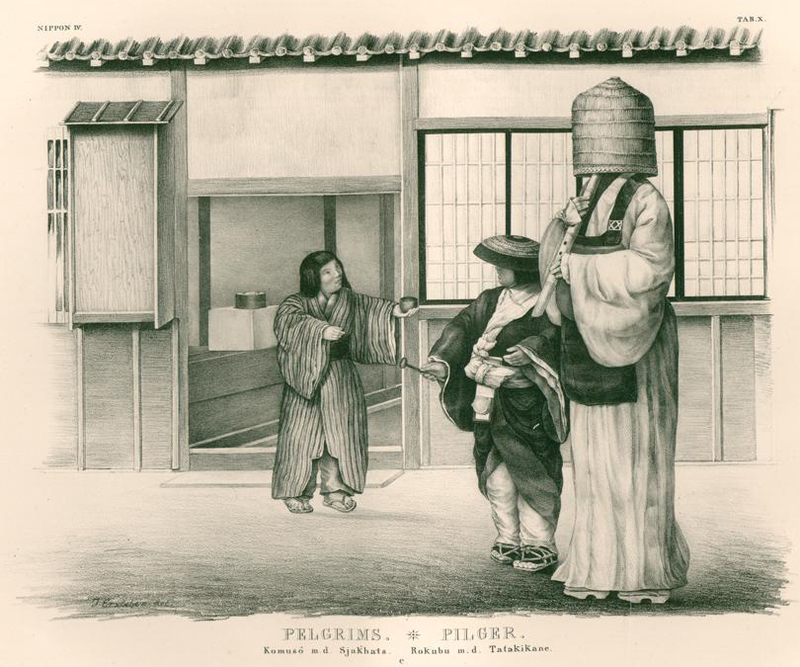 It was printed from an engraving based on an original photograph taken in 1861 somewhere in Nagasaki in SW Japan by either August Sachtler or John Wilson during the visit there of the official Prussian Expedition to Japan, 1860-61.
all of its "temples" and haunts were ordered to be closed, the premises be sold off, while komusō mendicancy was prohibited. Acc. 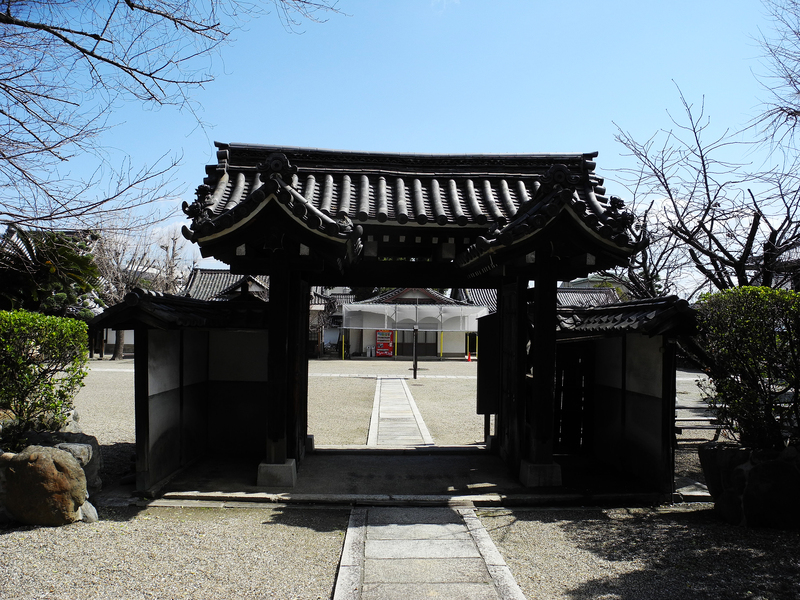 to Kanagawa resident shakuhachi player Maekawa Kōgetsu, 前川耕月, updating his weblog in late April, 2018, the old Myōan-ji main gate was disassembled and moved to an elementary school in central Kyōto to be reassembled there. 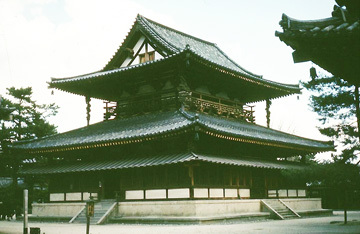 The old Myōan-ji gate reinstalled at Dainenbutsu-ji in Hirano-ku, Ōsaka. Photos: T.O. 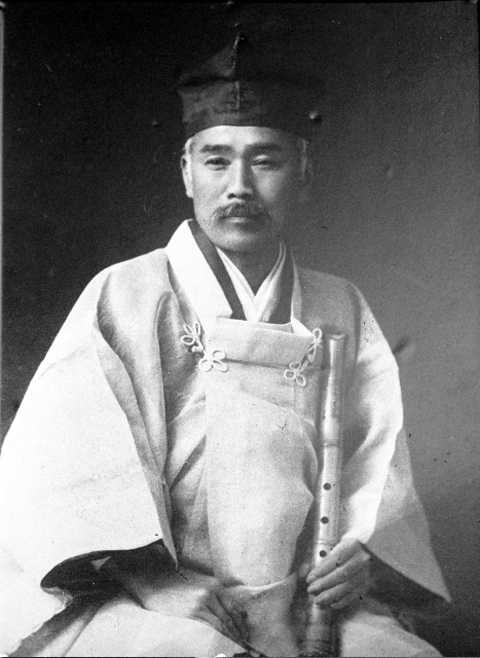 Founded the Myōan Kyōkai and the Myōan Taizan-ha tradition of ascetic shakuhachi practice in 1890. Oil painting by Sakaki Teitoku, 1858-1939: "Concert by Japanese and Western Instruments"
Ozawa Seizan sensei, 1939-2012 - Spring 1978. 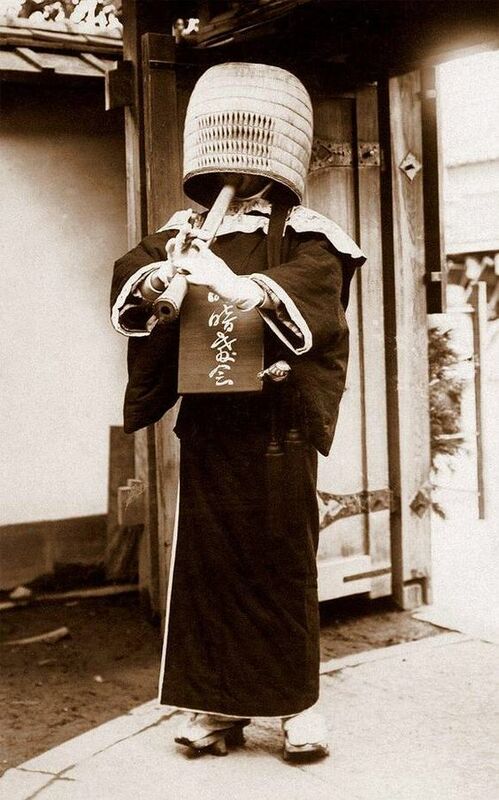 "No Hole Flute - Blow Ascetic Non-dual(istic) Practice"
inaugurated in 1952, died in 1984 (Shōwa 59). 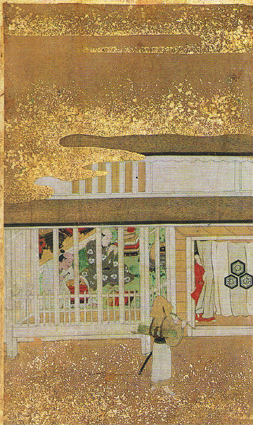 written by Matsumoto Kyozan, dated 1985. 'Suizen Way of Buddhist Enlightenment'. 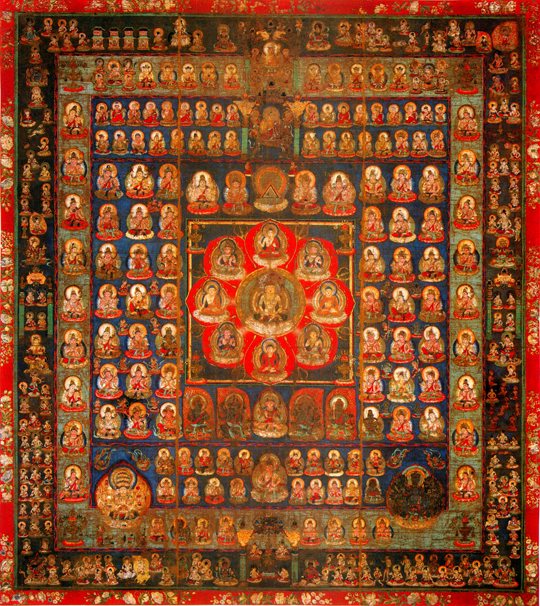 of Japanese Tantric Buddhism (Shingon). Vairocana Buddha (Jap. 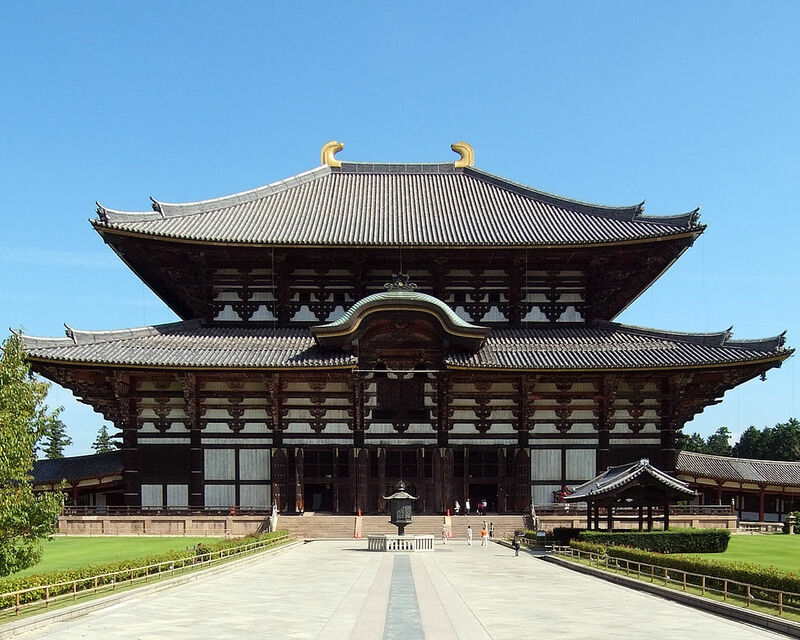 : Dainichi Nyorai) - Tōdai-ji, Nara, 8th c.
of the Buddhist concept of 'shunyata': "emptiness" - or rather: "non-duality". 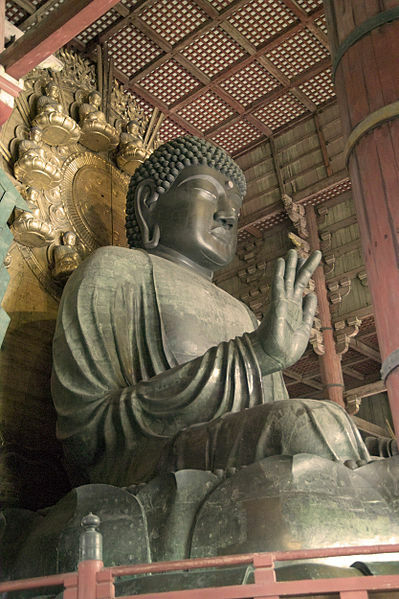 Vairocana is a central figure in Japanese Shingon Buddhism. in which the Great Vairocana Buddha is seated.